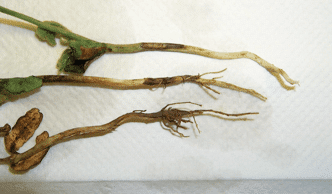 Rhizoctonia seedling blight is caused by the fungus Rhizoctonia solani and is one of the most common soilborne diseases of soybean. Common symptoms include red-brown, dry sunken lesions on the seedling hypocotyl, pre- and post-emergence damping-off can also occur resulting in stand reduction. 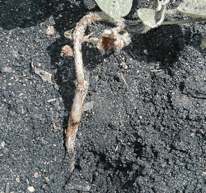 Infection can occur over a wide range of soil conditions and typically does not occur after the seedling stage (V4).